September 30 2017. Based on the latest information available to me, please consider the following adjustments to my earlier posted previews. Men. Late entrant, Ethan Nedeau, ran 16:22 in the recent CVS Downtown 5K, and Jonathan Frieder, whom I may have under-rated earlier, ran 16:08 in the same race. They will be right in with the group of Komocki, Putnam, and Stookey. Women. There are no late entries likely to upset the earlier preview; it stands as written. Women. The main adjustment to the age-Grading preview is to note that even if Jan Holmquist is slightly off her best, her 'slightly off her best' probably still age grades at 98% plus. She should certainly be listed as a contender. Holmquist finished 2nd at the 10K Championships, falling between Sabra Harvey and Edie Stevenson. There is no reason to expect any less from Holmquist at the 5K Championships. If so, that is likely to push Doreen McCoubrie off of the Age-Grading podium. Men. Nat Larson and Carl Combs both entered after the original preview was posted. Both will play a role in the age grading race, as they did last year, finishing 3rd and 5th. I now put Larson 2nd and Blaich 3rd but Combs could also sneak in there. Women 40-44. There are no late entries likely to upset the earlier preview; it stands as written. Men 40-44. Late entrant, Ethan Nedeau, ran 16:22 in the recent CVS Downtown 5K. That, plus his 4th place overall Masters finish at the 2015 10K Championship, seems sufficient for me to move him into the 3rd slot. Jake Stookey will have to beat Nedeau to make it onto the 40-44 podium. Men 45-49. Jonathan Frieder has the recent edge over Greg Putnam, having edged him by 16 seconds in the recent CVS Downtown 5K. Frieder should have the confidence, but Putnam has the revenge factor and the push factor of being in the middle of a competitive national team race.Elliott Frieder also entered, making the brothers Frieder the favorites to take home Dave Oja's Brother's Prize for the fastest team of 2 brothers after a 2nd place finish last year. 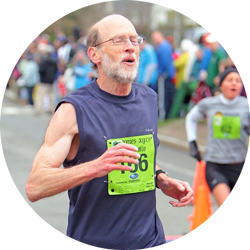 E. Frieder's fitness was off, as evidenced by his slower run this past May in the Broad street 10 Miler and in the Tribute 5K in July. However, he ripped off a 16:36 in a mid-September 5K. Women 45-49. The late entry of Dianne DeOliveira, coupled with Janet McDevitt not entering, comlpicates the podium preview. Had McDevitt entered, her prediction for 1st or 2nd would have moved folks down and I would have had Cassandra Henkiel in 3rd behind Mcdevitt and Sonja Friend-Uhl. The new situation means I need to choose between DeOliveira and Brenda Hodge. Hodge has been focusing more on longer events like the Boilermaker 15K where she ran 1:01:42 and a 3:00:16 Marathon at Grandma's. She ran 5K's in the spring that were both faster and slower than DeOliveira's recent 5K times of 19:38 to 19:39. Hodge also ran a 40:43 10K in September which is age-group equivalent to a 19:41. It is a close call but I will stick with Hodge for 3rd based on more extensive Masters LDR National Championship experience. Men 50-54. The late entry of Carl Combs makes this division a toss-up. Last year Blaich ran 6 seconds faster. The one odd thing is that Blaich has not run a race that I can find results for since his sterling 32:58 performance at the 10K Championships at the end of April. That is 5 months without a race; Blaich will be well rested, but not race-tested. Combs, on the other hand, has August 2017 5K results in the low 16 minute range and ran exactly the same time this year as last, 41:10 in the Lilac Bloomsday race in Spokane in May. Should that difference be enough to switch the runners? Perhaps not, but I will do so. I am not sure how I ignored Kent Lemme in my earlier preview. The staunch runner for the Greater Springfield Harrier clocked low 16's for some early summer 5K's after hitting 33:32 for the 10K Championships. I must have been hurrying too fast [cannot imagine why!😉]. I am afraid I need to pick Lemme to edge Brian Crowley off the podium. Women 50-54. If Katherine Wolski is the same person as the 'Kathy Wolski' listed on Athlinks (as seems likely), she is a heck of a runner with 5K's this summer in the 18:35 to 18:48 range and other supporting results like an 8th place overall at the 2016 National Club XC Championships in Tallahassee. I would make her the favorite and push others down a rung. Women 55-59. There are no late entries likely to upset the earlier preview; it stands as written. Now that I look back at the earlier preview, I wonder a bit about choosing Mary Swan for 3rd place over S. Lynn Cooke and Carmen Ayala-Troncoso. In that piece I note that Swan's times this summer seem to indicate a little less fitness than last year and that would be all it would take for either Ayala-Troncoso or Cooke to come in ahead of her. Ayala-Troncoso's 10K times this summer around 42:30 are age-grade equivalent to low 20's in a 5K. Swan has run her 5K's a bit slower than that. Given that Swan only beat Ayala-Troncoso by 5 seconds, it seems reasonable to reverse those two and make Swan beat Ayala-Troncoso on race day to prove me wrong. Cooke is also very competitive and will try to do the same. Men 55-59. Nat Larson's anticipated entry came to pass and I make him the favorite, given his recent record-breaking run at the CVS Downtown 5K in Providence. That pushes everyone down a rung. I will not have time to update any more previews. Luckily most of the late entries were in the divisions covered in this update. I did learn that in the Men's 70-74, Jan Frisby was brought up short by a kidney stone. He may skip the race or he may jog, but that is it. He will not, after all, be a threat for the podium. Estelle Hahn who is now entered in the Women's 75-79, came in over a minute ahead of Christa Maier last year. She has no recent results posted but it seems she would be likely to prevail again. So I put her now as predicted for third behind Fran Rowe and Madeline Bost. First click on the category 'All Team Divisions' and then on either the 'Men' 'Women' or 'All' depending on your interest. Good luck to all of the runners tomorrow--May we all be swifter than we can imagine!